Celebrate your rights with Legal&Tax. Sign up for our 30-day free trial! Your rights deserve to be protected. Now you can afford to have the law on your side. With the help of Legal&Tax, a highly experienced lawyer is a phone call away. Legal&Tax’s affordable range of funeral plans means your family has access to the finances they need at the time they need it most. No stress. No confusion. Leave your tax concerns to us. From submitting your annual tax returns to communicating with SARS directly on your behalf, our team of experts are available to you. Debt may affect many of us, but that doesn't mean it can't be conquered. With Legal&Tax, a professional debt counsellor will help you restructure your debts, making sure your repayments are manageable and affordable, so you can enjoy a debt-free life. In an emergency, Trauma Assist will connect you to a crisis manager within minutes. That way, in times of stress, Legal&Tax will always be there for you. From telephonic trauma counselling and face-to-face counselling, to a private ambulance service and medical assistance, we go the extra mile for our members. "After I was retrenched last year, I was unable to pay my bills, like my DSTV account and my credit cards. I then started receiving threatening calls from debt collectors. That's when I turned to Legal&Tax for help." "After I was retrenched last year, I was unable to pay my bills, like my DSTV account and my credit cards. I then started receiving threatening calls from debt collectors. That's when I turned to Legal&Tax for help. The supportive debt counsellor at Legal&Tax explained that, by selling my wife’s car, I could save the money needed to pay back my debts. Thankfully, I now have a new job and hopefully, once I have saved enough money, I will be able to buy a car soon." 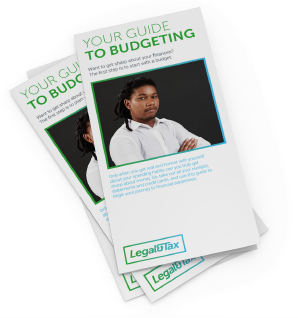 Have you seen our budgeting guide?